My Third Book is Out!!! Yippee! My third book is out now!! This one is part of a series from Prism Book Group, called the Love Is… series, and all the novellas are based on one of the characteristics of love written about in First Corinthians chapter 13. My novella is called A Work in Progress, and is based around the concept that love does not boast itself. It’s got a lot of dimensions to it. It has some light-hearted moments, thoughtful and dramatic ones, some soul-searching, and plenty of chemistry between the two main characters! It’s all about love and the many twists and turns it creates, especially between two people who didn’t plan on even liking each other. Buckle up for a fun ride! What a glorious day. Julie indulged in a slow walk to the steakhouse, reveling in the autumn breeze and its hint of chill. No need to hurry. She’d be early as usual. The sight of the varied trees lining the sidewalk, sporting their vibrant colors, with a bright blue sky above them, ignited a sudden desire to skip. After a humid summer, there couldn’t be a more magnificent time of year than harvest time in the Finger Lakes. Cool air, clear skies. She glanced at passersby and wondered about their response if she did skip down the walkway. So what if she was almost thirty? A grin spread. Why not? Joy was way more fun than heartache, after all. She launched into a series of skips. Laughter bubbled up, as much at herself as the scandalized reaction of a nearby cat, who shot off a porch and into the shrubs. She couldn’t help giggling at the frantic exit, with the cat’s tail fluffed out to twice its size. Too bad the poor thing couldn’t appreciate her joy. She gazed upward. Who could fail to take delight in such a perfect day? God deserved some recognition for creating all this beauty. She almost sang, but figured the skipping would do for now. She beamed in response to the few odd glances she received from pedestrians, and strolled on. The familiar scent of the steakhouse greeted her as she drew near the back door. The outer exhaust fan blew a warm, aromatic breeze into the back lot, laden with hints of caramelizing onions, simmering soup, and grilling meats. Better advertising than any media spot or food photograph could be. How many customers had said they first showed up just from the inviting aromas? She sniffed the air and grinned before she shrugged out of her coat, hung it, and curbed her spirits to prepare for focusing on work. Though demanding, she enjoyed the job. Showing up at three in the afternoon hadn’t lost its charm, even after two years. After a long stint of morning-shifts at diners and cafeterias stressed her night-owl blood, this place was a true blessing. Day jobs left too much evening time for brooding. Mark and Chris trimmed out steaks at their stations, while a rack of ribs wearing a shiny coat of sauce sizzled on one of the grills, and a large tray of shrimp waited at her station. Time for prepping. The two nodded a greeting at her. Chris’s big bald head shone, and he chewed on his ever-present wad of gum. Mark openly teased Chris about his “oral fixation” and said if he wasn’t chewing or smoking, he was eating or asleep. The two loved to harass each other in ways that seemed rough to Julie. But they obviously delighted in the practice. His dismissive tone offended her. Maybe she hadn’t cooked as long as he had, and wasn’t a chef, but everywhere she worked before, people were expected to cover their hair. If he did, he wouldn’t need to scrutinize each finished plate with such intensity. She gave her almost invisible hairnet a few quick pats to assured her of its proper position. It tickled her that she ate lunch when most other people were preparing or thinking about their dinner. After ten years in food service, she relished having work she loved. Something to look forward to. The hard work and fast pace suited her, while providing excitement at the same time. Thanks, Lord. I appreciate this job. In a second, with no warning at all, everything changed inside Mark. He swallowed, blinked his eyes and breathed in. A strong wave of disorientation chilled through his body and prickled the skin on the back of his neck. Panic rose like bile in his throat. What on earth was going on? His frantic gaze traveled the familiar terrain of the restaurant. He inhaled the warm, fragrant air, and flicked his sight to the half-eaten food arranged on the shiny plate below him. He’d planned to hurry and finish his meal before the dinner preparation began and hectic hours would pass before he’d get another chance to eat. He wanted to ask Chris what he thought of the sauce he’d created, but the strange sensation overcame him and stopped his motions, his question, his life. Chris continued to chew his own portion, eyes trained upward while he sampled the food and let his palate analyze the flavors. After five years of cooking together, the two men were each other’s best critics and supporters. Mark’s attention diverted from Chris’s upcoming verdict, eclipsed instead by the overpowering chilliness consuming his brain. Why did everything look different, and feel so odd? Was he on the verge of some sort of collapse? A stroke or something? No, people in their early thirties didn’t have strokes. At least, he hoped not. He gave a quick glance through the window as he strode past it. Julie stood near the table he’d left, her face and Chris’s wearing the same puzzled expression as they stared at him. He looked away. It didn’t matter. He had to leave. The cool early fall wind failed to jar him back to his familiar internal terrain, that comfort zone that seemed a million miles away now. The street sounds of traffic and people hurrying and conversing fell on muffled ears. He almost screamed help in order to test his hearing and try to halt the creepy, doomed sensation, but quickened his pace instead. God, please help me. Something’s really wrong with me. Desperate to make sense of his plight, he cast about for something, anything similar to connect the experience with. Perhaps the time he got in the fender-bender with Grandma. He’d slammed his head on the door frame of the car, followed by a rush of adrenaline that numbed his skin and blunted his senses. The odd disoriented haze had taken a while to clear. But he hadn’t hit his head, or anything else. Had he suddenly become allergic to the food he’d been eating? A spontaneous shellfish or spice allergy? And why did he feel like running? The car accident years ago made him dazed, not poised to flee like a spooked deer. This same street he walked down every day now sported details he’d never noticed. Numerous cracks in the sidewalk’s uneven surface, the aged, brick facades of buildings with signs he’d ignored perched across their tops. Somebody worked inside each of these places, trying as hard as he did to make a living, and really get somewhere. Funny how he’d never thought of that before. They were mere buildings to walk by on his way to work, while his thoughts percolated on the day’s challenges. “Hey, Mark.” A short older man gave him a nod and a quick smile as Mark hustled past him. Bob, that’s who it was. He came in for dinner sometimes, always sat at the same corner table and ordered a medium-well strip steak. Mark remembered because once he’d undercooked it and needed to re-fire it for him. He’d been polite about it, not like some customers who talked to him as if he were stupid if their food wasn’t just right. By the time he turned his head to acknowledge Bob, the man was far down the sidewalk. He stopped to watch his retreat, wondering at the odd impulse to talk to the man, connect with someone who knew him. The wind gusted, and he crossed his arms, wishing he’d put his chef’s jacket on over his t-shirt. At least he could sense temperature on his skin again. The numbness had receded somewhat. A small brown and white dog with short fur came to a stop in front of him. After staring up for a long moment, it blinked its round hazel eyes and scuttled past him. The novelty of an unleashed canine caught Mark’s attention, as well as the intent eye contact. The animal seemed to grasp his unease. As though borrowing direction from the dog, he followed it. While he scanned the storefronts and tracked the dog’s progress, the nearby “Free Clinic” sign stood out. He walked in and sank onto one of the empty plastic chairs. He should get examined. They’d figure out what was wrong with him. I should be at work. Poor Chris and Julie. He patted his pocket, but his phone was back at the restaurant, in his coat. Still disoriented, he slumped his shoulders and clasped his hands together near his knees. Why was he sitting here? A round, dark-haired woman in blue scrubs sat at a desk, brows pinched while she scribbled on a sheet of paper, eyes darting to the face of the slender woman seated beside her, holding a wiggling little boy. A rumpled man of indeterminate age who had an unhealthy appearance slouched in a nearby chair, head down, while a slight snore sounded from his nose. Dark stubble covered his sallow cheeks. Mark wondered what disease the man might have. At least he was comfortable enough to sleep. The skinny woman and restless boy rose from the desk and disappeared behind a long rectangular curtain that bisected the room. The nurse caught his eye and beckoned to him. He shuffled over and parked in the chair. He supposed that was a good sign. Maybe there wasn’t anything seriously wrong with him. But something was off. Cindy scribbled more information on the sheet. The slender woman, carrying the little boy, emerged from behind the curtain. Cindy shot the woman a nod, sighed, and handed the paper to Mark. “Go on back. Doorway on the left,” she said. “Oh.” Mark rose and stepped around the room divider, paper in hand. Echoes of childhood doctor visit nerves rippled through the inner numbness while he regarded the door to his left. He drew in a breath. Might as well go in. 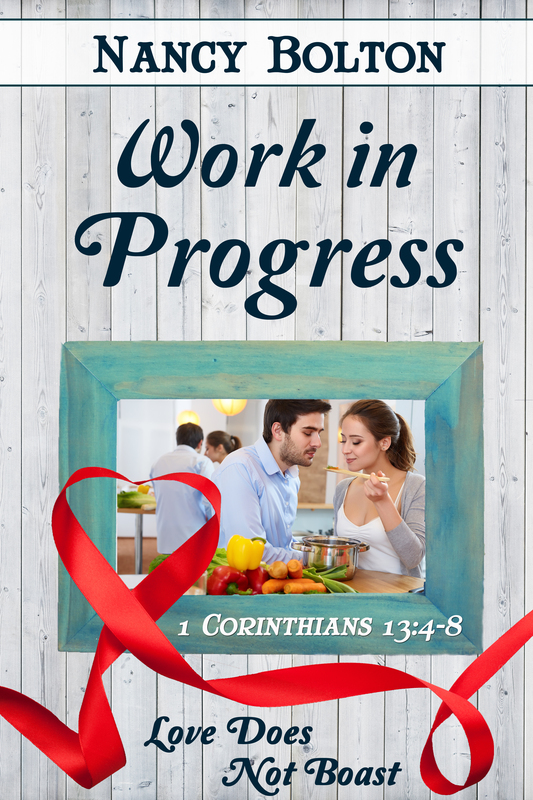 Nancy Shew Bolton, author of other Prism novella favorites of mine, Hidden Storms, and The Right Ingredients (both on sale at 99 cents each), adds another winner to the Love Is line, based on the apostle Paul’s famous biblical passage in I Corinthians 13. “Love does not boast” means gifted, talents chefs Julie and Mark, who work at the same steakhouse restaurant, each with their special creative abilities to turn out new special dishes, should not let stress affect their work. When Mark visits a clinic for troubling symptoms, he meets new friends who help him put his life into perspective. But when he learns about Julie’s secret outside-of-work life, his sense of duty wars with his curiosity. Used to getting the attention of girls, Julie is a puzzle Mark is determined to unlock. When their lives circle around and a mutual project brings them a fresh purpose, these cooks definitely sizzle. If you enjoy the story, please leave a review on Amazon or Goodreads! Thanks! ← “HIDDEN STORMS” IS OUT!! I’m so excited for you, Nancy! Thanks for sharing the first chapter. Thanks, Erin! How are you doing? What are you working on?